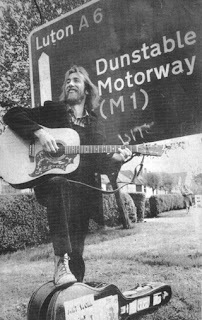 For the last 40 years I have worked as a singer of folk songs and as a storyteller; sometimes one, sometimes the other, but usually performing a mixture of the two. (see my first post from June 2015 for thoughts and reactions to that.) Last month I wrote about the first stories I heard and learned. This one is about my first songs. Another time I will probably write about my musical experiences while growing up but I’ll start this in 1965, the year I went to college. Prior to college I had no interest in ‘folk music’ at all. What I had heard all seemed rather weak and watery. In a school Christmas Review a trio of boys sang Blowing in the Wind and in the Prefect’s Room a Bob Dylan LP went round but I could not get my head round it at all. I was playing in what we called a ‘beat group’ with a repertoire made up largely of Rolling Stones and Chuck Berry material, and the occasional detour into Howling Wolf or Ray Charles—definitely not weak and watery! 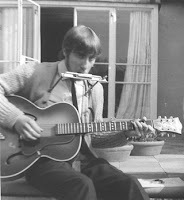 At college there was no outlet for that kind of music but there was a folk club. It was all very much of its time: a lot of Joan Baez; Peter, Paul and Mary; Paul Simon; and self written songs. Just occasionally someone would sing something English—a Ewan MacColl song or something from the Spinners, perhaps. What it did for me was: it started me writing songs. After college I continued going to folk clubs performing a typical mix of material—my own songs, songs by other artists and an increasing number of traditional songs and I started to pick up the occasional booking. By a very lucky coincidence I got a ‘record deal’ that summer as well. (That sounds much grander than it was!) The firm was VFM who specialised in making very cheap cassette albums which sold in Boots and Woolworths and outlets like that. Much of it was very middle of the road. The aim was making money rather than good music but the two albums I made for them were a really big help. For years afterwards I’d go to places for the first time and find that people knew my material because of a 99p tape they’d found in a bargain bin! And they’ve stayed in people’s collections. In the last few years I’ve had several enquiries as to whether they are available on CD—which they’re not, although I have re-recorded a few of the songs on other albums. 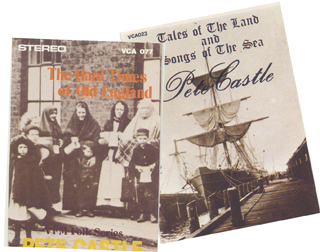 The first album was called Tales of the Land and Songs of the Sea. It was recorded on a very basic tape recorder in a room over a music shop in Spalding, Lincs. with the Tulip Parade going by outside! 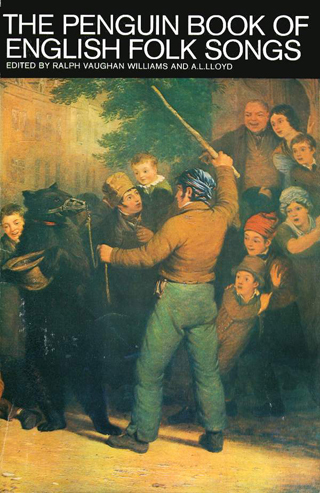 The running order was: The Unfortunate Tailor (from which the title was taken); Rambling Sailor; Polly Vaughan; The Willow Tree /Sir George Gordon (tunes); The Irish Girl; The Queen of the May; Bonny Green Woods (learned from Roy Harris); The Highwayman Outwitted by the Farmer’s Beautiful Daughter; Adieu Sweet Lovely Nancy. That was typical of what I was doing in folk clubs at that time. And 4 or 5 of them have stayed in my repertoire ever since. Here is Polly Vaughan sung a year or two back. The performance is infinitely better but the arrangement has hardly changed. I think Polly Vaughan is a great song and seems old, or at least based on an old theme but for some reason it isn’t in Prof Child’s famous collection of British ballads. My abiding memory of it is of a request: “Will you sing that song about the woman who got shot in a pub?” I couldn’t think what she meant until she gave me a clue: “I think the pub was called The Swan…” ‘In the room of a swan’ is a quaint Old English way of saying in mistake for a swan! The second album: The Hard Times of Old England was much better technically. VFM went to town and booked me into a proper studio in London - St Johns Wood I think. The engineers really knew what they were doing and, although we again only had a very short time to do the recording, the results were much better and even allowed for some over-dubbing! Hard Times of Old England; Turpin Hero; Shepherd’s Song; Ship in Distress; Home Dearest Home; Princess Royal (morris tune); I Loved A Lass; Jim Jones at Botany Bay; The Plaitman of B...shire’ John Barleycorn. Looking through those two lists you will probably realise that most of the songs come from one of two collections: either The Penguin Book of English Folk Songs or the EFDSS book Marrowbones. Those two books were amongst the very few easily accessible sources of material for those of us who did not live within easy reach of Cecil Sharp House and the Vaughan Williams Library. Over the decades I must have sung at least 50% of the songs in them and a lot are still there in my repertoire. The version of John Barleycorn caught on. I set it to the hymn tune ‘We plough the fields and scatter…’ which was appropriate and fitted like a glove. I don’t know where I got the idea from... It might have been mine but I seem to remember that I either heard a group somewhere do it or I heard a report of someone else doing it. However, it went down as my arrangement and a lot of people learned it and credited me as the source, which was great. Here it is from the original recording. Remember it’s me in 1979 not now! I sing and play much better now and don’t have the same strange accent! How does that fit with your memories of the time? Does it ring bells? Did you buy one of those albums? Let me know if you did... when and where.